An ECU upgrade affects a broad range of motor performance. Therefore comparing before and after results cannot be summed up by a single number. 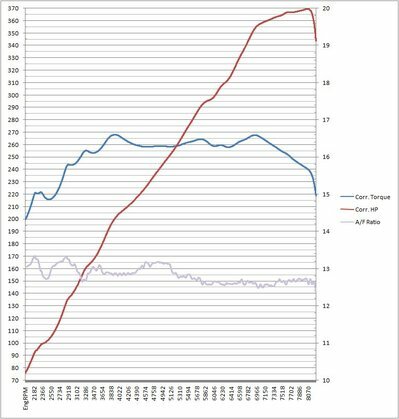 Max HP and max toque will not be enough; we need to look at the entire graph of performance over the broad RPM range. The Active Autowerke ECU upgrade gains its performance by opening the throttle valves earlier and changing some of the fuel/air mapping tables, spark timing, and camshaft timing. 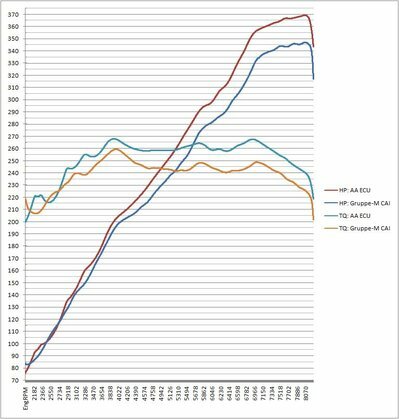 To help decipher where the AA ECU adds and subtracts power, The following graphs demonstrate where the gains and losses occurred. 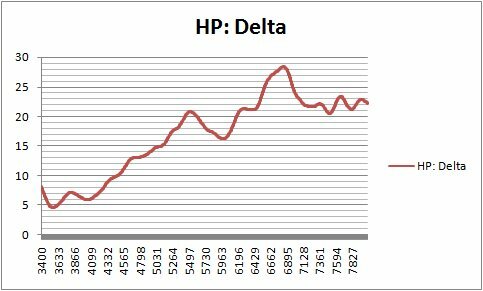 Since measuring below 3000 RPMs is difficult and produces wildly erratic results, the deltas in the lower RPM ranges can safely be ignored. Camshaft Vanos Remapping (No more Rough startup (experienced when car is cold for emmissions purposes). Car will idle smooth at startup. Stationary RPM limiter changed. Holds RPM at constant rate until the car starts moving. RPM is specified by customer. 3500 RPMs recommended. This feature is the equivalent of 'Launch Control' for 6MT owners. Offroad features: Remove rear O2 sensor mapping at customer request -- for customers who run straight pipes in place of rear catalytic converters. Unlike the ESS ECU upgrade which seemed to emphasize plenty of bottom-end torque, the gains of the AA ECU are so broad, you don't really notice the bulk of the power in any specific RPM band. That is until you get above 7000 RPMs and expect the power to start dropping off. But instead of dropping off, the AA ECU keeps making more, and more power, until you literally bounce off of the RPM limiter. AA will increase the RPM limiter if you desire. Since the motor only makes maxHP at 8100 RPMs to begin with, I saw no point to increasing the RPM limiter. AA removed the speed limiter, thus allowing us to go above 165 MPH for the first time. But instead of testing this feature on the road, we tested it on the dyno. On the dyno, we ran 5th gear up to readline, and saw a speedometer reading at 180 MPH -- thus proving the speed limiter has been removed. I also had a chance to test the "Launch Control" (stationary RPM limiter). I had AA set this to 3500 RPMs. While stationary, you can floor the gas, and the AA ECU will hold the RPM to this level (3500 RPMs) until you pop the clutch. Once you pop the clutch, the stationary limiter is no longer in effect. This was a very cool feature, something I used while trying to run some 1/4 mile times. AA claims that gas mileage should increase with their ECU upgrade. I saw nothing in my driving that would indicate otherwise. Gas mileage really seemed the same to me. I never had a chance to drive the car on a long distance trip, so I never came up with any real highway results. However, mixed city/highway driving certainly didn't lose any MPG, though I would be hard-pressed to say I gained anything. I had one small problem during testing. With the AA ECU upgrade, my check-engine light went on. 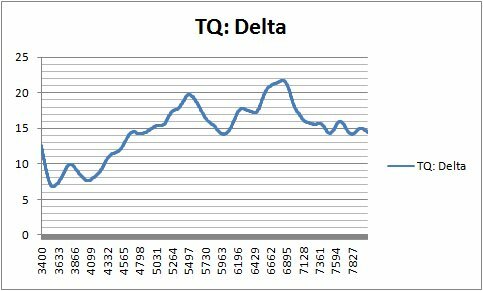 I used an OBD2 scanner to read the code (0068), and it says there is a constency problem with the fuel-air maps. This is probably easy enough for AA to fix...but I never had a chance to let them fix it. I know everybody wants me to compare the AA ECU to the ESS ECU upgrades. It would be very unfair for me to compare the two because I never got any valid dyno results on the ESS software (due to a testing problem), and I only drove around with it for less than one week. I will say that it seems like the AA ECU upgrade got better gas mileage, and a broader power increase. I also liked how the AA ECU seemed to continue to make LOTS of power until it bounced off of the RPM limiter, whereas the ESS ECU seemed to tone itself down at the upper RPM ranges. AA offered me a deal on the ECU upgrade in exchange for dyno testing and this review. The results presented here were the best results we observed (same thing I've done in all past postings). I tried not to let their generocity influence my review. My goal was to give an honest and accurate review that contains both the pros and cons of the ECU upgrade. This page contains a single entry by PencilGeek published on October 14, 2008 11:19 AM. 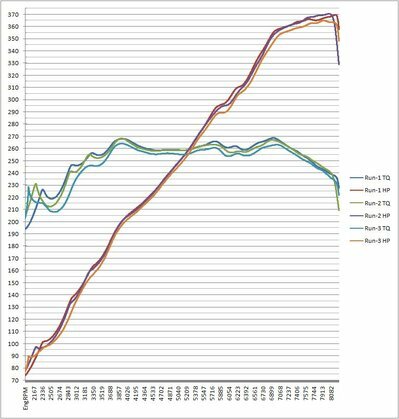 Dynapack Dyno Results: ESS Tuning ECU Upgrade (351whp, 268wtq) was the previous entry in this blog. Video: BMW E92 M3 with Ericsson M480 Full Titanium Exhaust (Part-1) is the next entry in this blog.